Central Park turns into Super Mario Bros with this Augmented Reality app « Adafruit Industries – Makers, hackers, artists, designers and engineers! You thought you’d seen the pinnacle of augmented reality nuts scouring our parks in search of Pokemon last year… This year’s AR App obsession is already here, and it’s awesome! What is it with Nintendo? Bit by bit turning our city into their games through the lens of our cell phones. Whatever the games giant is putting in our water, it seems to be working. This year’s craze just arrived, and it looks cool as hell. This time you’re not hunting down Pikachu, you’re wandering around Central Park as if you were Mario himself. 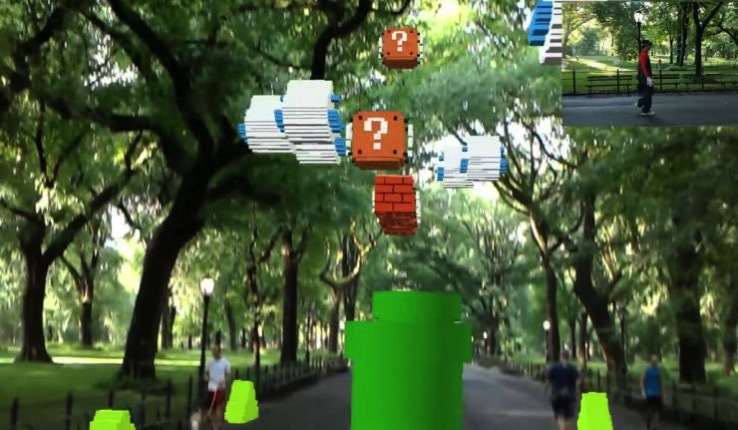 Abhishek Singh recreated a life-size Super Mario Bros level and played it wearing HoloLens in Central Park. For added impact, Singh did this all dressed as Mario and he filmed the augmented reality experience (you can see it in the video below).